I get a lot of emails from teachers saying how their kids are running around out of control and don’t pay any attention to anybody. I do sympathise and have seen far too many classes like that myself! It might seem tempting to just say “well, the lessons are too boring then!” but you often need to dig a little deeper. 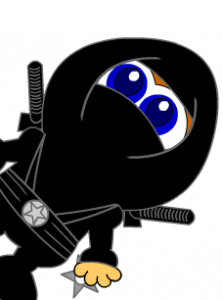 Over the years of helping lots of teachers I’ve come up with some “ninja secret” steps that in most cases cure the problem, often after just step 1…. First thing is that you need to impose controlled discipline so they don’t go running off and doing other things. If the kids are playing up there’s a good chance they’ve never seen proper discipline before. And if that’s the case, believe me they will *love* that you are introducing some structure and guidance into their lives. The next thing is to make sure the kids understand the English you use in class, both the target English of the lesson *and* the English used when you explain things. Especially games. Lower than this and they won’t improve. Higher than this and they won’t understand. And kids will always switch off when they don’t understand. So either use English they do understand, or simply use their own language when needed. Now we can start on the content, which means English *they* want to learn and to teach it *how* they want to learn. If you were a kid in this class, what English would be the most useful to you? What phrases do they use with each other in the playground? What questions do they ask foreign visitors to the schools? What questions do they drive their parents crazy with? What are their most commonly used words? Just follow the tips part way through this page and I’ll walk you through it. So look them up, and as long as you cover everything in there, no one will complain. You’ll have kids who love classes and pay attention. P.S. Today is the last day of the Teacher’s Set special price, if you’re interested get your order in soon! I am a regular reader of your newsletter and blog. I just wanted to say thank you for making all of this stuff available. Great tips Richard! Thank you once again for making our lives easier!! I do like your web page, it’s just great and useful, thanks a lot for your useful ideas! I always find your advice useful Richard. When I first got into this line of work years ago, I used to think of some students being too “quiet” and that they “never talk.” But then I watched those same kids speak in L1 and saw that they were total chatterboxes. Something was amiss. Your Ninja Tip #3 is something I have really taken to heart since it’s such an important concept. It’s not that those children were incapable of speaking, or just shy. Rather, they just didn’t have the tools to say what THEY wanted to say. You can’t build a garden shed if you don’t have wood, nails and a hammer. Once I started teaching them things they want to know, instead of what the powers-that-be wanted them to know, the talking followed straightaway. Student-centered learning is where it’s at. The easy way to get a classes attention is to whisper. All kids want to be in on what is said and almost stop instantly to hear.